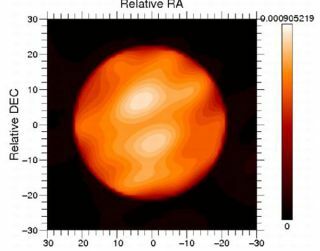 This infrared view of the red supergiant star Betelgeuse in the constellation Orion reveals two bright spots suggesting the presence of convection, similar to that seen on the sun. Data from 3 telescopes was combined for this image. A snapshottaken of a giant star hundreds of light-years from Earth has revealed twoenormous bright spots - the first direct evidence of sun-like heattransportation on another star, scientists say. The newinfrared view shows the behemoth star Betelgeusewith two bright blotches near its center. The bright spots are hotter than thesurrounding area, indicating regions of convection where heat rises from theinterior of the star to its surface, just like on the sun. Theconvection may play a role in Betelgeuse's known and prolific weightloss, researchers said. The star is shedding the equivalent of one sun'sworth of mass every 10,000 to 100,000 years. It is also expelling a giganticplume of hot gas that may be related to the convection, researchers said. Betelgeuseis a red supergiant star 600 light-years away and easy to spot in the nightsky. It forms the right shoulder of the "hunter" in the constellationOrion. The star is enormous, about 600 times the size of the sun and 20 timesas massive. ?Thesituation on Betelgeuse seems pretty much different than in the case of thesun,? said astronomer Guy Perrin, a co-leader of the research team at the ParisObservatory. ?The convective cells are far much larger.? The brightspots, like the star itself, are also vast, with the larger of the two spanningof more than 139 million miles ? 1 1/2 times the distance between the Earth andour sun, researchers said. This larger spot is about one-quarter the star'sdiameter, they added. Similar spots on the sun are about one-twentieth thewidth of the star. Aninternational team of astronomers led by Paris Observatory astronomer XavierHaubois and Perrin observed the Betelgeuse bright spots using three telescopes in Arizonaand a method called interferometry ? which combines observations from differenttelescopes into a cohesive whole to provide greater sensitivity. The spots,researchers said, indicate that in supergiants there is active convection,which is the process of heat moving through matter currents. ?The starhas a patchy surface produced by a few convective cells,? Perrin told SPACE.comin an e-mail. ?Now we need to better understand the physical properties ofthese cells to go further: their temperature, their lifetime, their connectionto magnetic fields, etcetera.? Convectionis the process that brings bubbles to the surface of boiling water in yourkitchen. On the sun,bright convection hotspots and darker lulls (cooler areas) can easily beobserved from Earth and are well-known. But that's not the case with supergiantstars like Betelgeuse, where the size, longevity and dynamics of convectionstructures remain a mystery. The surfaceof Betelgeuse is typically about 3,600 Kelvin (6,020 degrees Fahrenheit), with thebright spots burning about 500 degrees Kelvin (440 degrees F) hotter,researchers said. The surfaceof the sun, for comparison, is about 5,810 degrees Kelvin (10,000 degreesF). Researchersplan to study other layers of Betelgeuse to better understand the interactionbetween its surface, atmosphere and interior, as well as how they compare toother supergiant stars. ?Betelgeusemay not be an isolated case and is not necessarily peculiar with respect toother stars of the same class,? Perrin said. ?So we may anticipate similarcells on other red supergiants.? Theresearch, announced Tuesday, is detailed in an October 2009 edition of thejournal Astronomy & Astrophysics.